All planets place a stress on the time space continuum for a distance of 3 Light-Years in all directions. 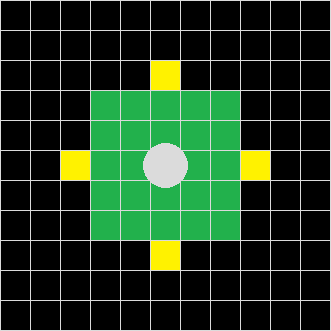 Any ship that ends its turn within 3 Light-Years of a planet is in the planet's warp well (the green and yellow squares in the image below), and will fall into the planetary orbit automatically; the ship's waypoint will be unchanged. Ships with multiple waypoints set (see navigation) should be cautious of this. Zooming into a single planet on the Starmap, the warp well becomes apparent as a grid around the planet. Non-moving ships and ships with a warp speed of 1 are not affected by warp wells; not even ships equipped with Gravitonic Accelerators. Ships under tow travel with their towing craft. A ship that is hyperjumping is still affected by warp wells, unless it ends at exactly 3 Light-Years from the planet (the yellow squares in the image).